So it's that time of the month again . . . VACATION! Yeah, my year round schedule seems to have me going no more than 5 weeks without some sort of break. Don't hate me. With the intensity of the families with whom I work and the nature of my job, it often feels like I need all of the vacations I can get. Ten 01, and definitely enjoy some fine drinking chocolate at Cacao. We'll see what our budget allows. I also hope to have the rest of our house painted by the end of the two weeks as the Portland Development Commission is painting our whole house for free since we have lead paint. As soon as we get some sun it should be all done. That should be enough to keep me happy this break. I'm hoping to make things a bit more visual on this blog, but with little tech knowledge, I can't seem to get pictures to format right on this blog. I'll keep trying. Nice lookin' coop! I am looking forward to seeing your version. 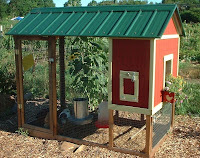 Do you already have a source for full-grown hens, or are you buying pullets? 6 layers will probably give you 3+ eggs a day, which is probably just right. Our 10 are putting out 7 a day average (not including the bantams). They are really great entertainment too. Happy hour at 10 01 was the next one I wanted to try...looking forward to a full report if you guys beat us to it.